A couple months back we installed our newest fermenter, a custom-sized tank named Peanut. We thought we were out of floor space for more tanks, and lo and behold we identified a small footprint next to the brewhouse that helped us address a pressing issue. The issue is the ever-increasing demand for new beer creations…which is a bit of a snake eating its tail, but maybe I’ll get to that later or in an altogether separate blog. Our brewhouse is 15 barrel (bbl), and our smallest fermenter was 30 bbl, while most fermenters are 45 bbl. Last year we decided to release a new small batch series beer every month in 2018. Each beer would be a single turn (15 bbl) on our brewhouse. 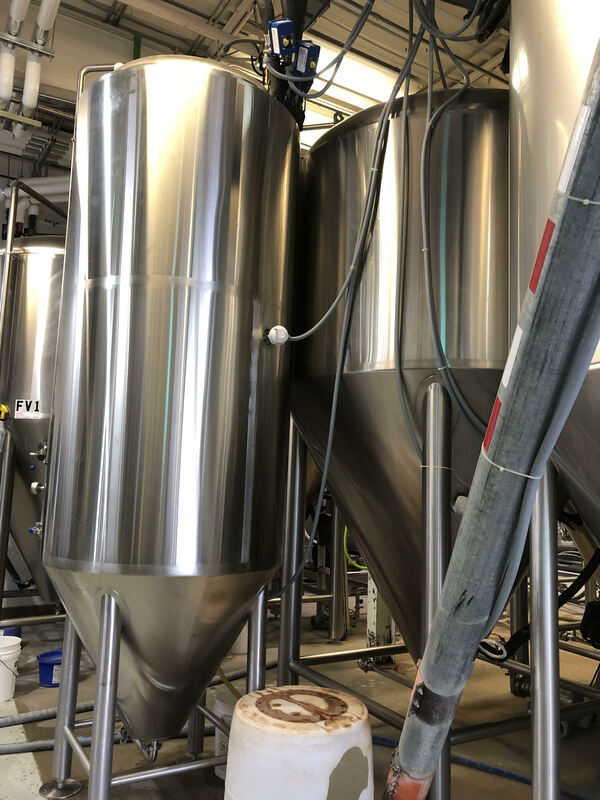 Our 30 bbl fermenters can handle being half-filled but are inefficient at that volume, especially when it comes to crash cooling down to 30 degrees Fahrenheit as half of the cooling jackets are heat exchanging again the air in the top half of the tank. Also, as our overall production was increasing it was hard to have a tank plugged with a small batch beer, particularly when those beers require much more fermentation time. Peanut helped us address these issues by being a 15 bbl single batch uni-tank dedicated to exploration and mayhem. The uni-tank identifier means that there is an integrated carbonation stone so we have the option of carbonating the brew and then kegging directly from the tank, versus centrifuging and/or transferring to a bright tank for carbonating and packaging. We weren’t sure how often Peanut would be used as a uni-tank, but as it happened the first two batches through the tank (Me So Hazy and Camerlot) took advantage of the option. So what’s the longterm outlook for Peanut’s tenants? Tons of awesome. Let’s start with a recap of Camerlot. Peanut is on the left. Camerlot is a beer-wine hybrid made with Merlot juice. There are several outstanding breweries dabbling in this space, and I look forward to an in-depth exploration of the category in years to come. 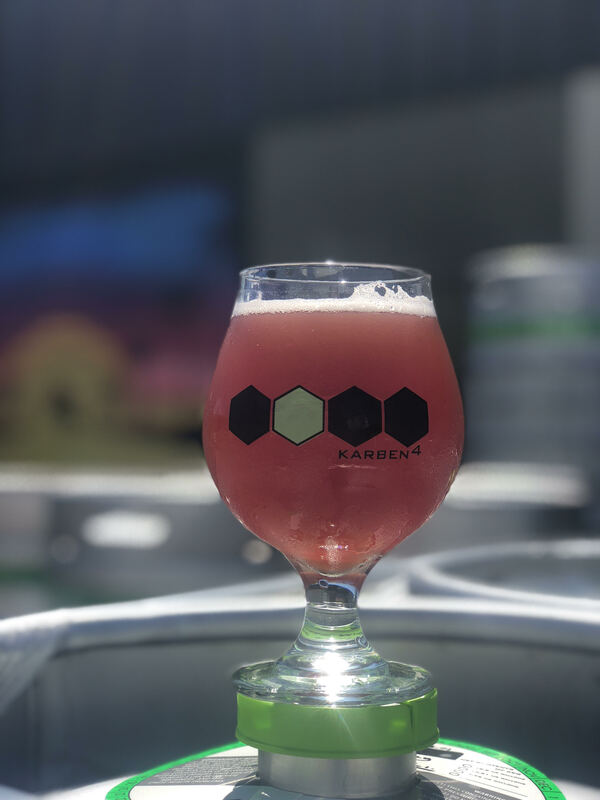 The first time I had a beer-wine hybrid was towards the beginning of Karben4 when my brother, Zak and I had a few bottles of “61” by Dogfish Head (basically 60 Minute brewed with Syrah grape must). If you have not had it, seek it. For years after I harbored the thought of incorporating grape must into something, and last year our Head Brewer Jeff Olson made an Oat Ale named Totes McOats. It was delicious and I immediately thought it would make a great platform for mixing in wine grapes. I sampled two of my favorite wine grape varietals, Cabernet Sauvignon and Merlot, with some of our Dragon Flute APA to see how they would live in beer and get along with hops. While I will still do a version with Cab Sav, the Merlot won out the initial competition because of all the popping fruit tones. The experiment also instructed me on which hops to choose and how best to utilize them. I went with Hull Melon hops, as they offer honeydew melon, strawberry, and other bright fun flavors and aromas. On brew day we pumped 62 gallons of Merlot juice (we didn’t have the time and equipment to deal with full must) into Peanut, pitched in ale yeast, sealed the tank, then pumped in 15 bbls of oat ale wort. The components mixed and became something altogether new, and delicious from Day 1. This was one of the few beers that I anxiously sampled every morning for several weeks. I was nervous about many things: did I use the right proportions? Will the grape components have enough time to properly develop? Will the yeast have any issues? Will it always look like purple Kool-Aid or will it tone down to a beautiful rose hue? In the end I could hardly be more proud of the results. I really love this beer. I love the layers of complexity, yet how the overall experience can still be simple. You can easily find the layers if you look, but don’t need to participate in the debate if you just want to sip away. Also, you don’t need to be a vinophile or beer geek to “get it”. I know a few wine enthusiasts that I can’t wait to share this with. I hope my beer nerds enjoy it as well. The future will see us brewing more versions and definitely wine-barrel aging. On deck is a Nutella Stout…or if that infringes on trademarks, a Chocolate Hazelnut Stout. While I love brewing dark beers (and think K4 is rather talented at it), this is another beer style I have never done before. I definitely have a sweet tooth, so many of my favorite sweet treats end up in beer form. My wife and I honeymooned in San Francisco, and one of the days was spent in Monterey on a whale watching tour. While we had fair weather and higher than normal whale activity, I learned something about my new wife….she gets incredibly motion sick! Before you start cursing me, she suggested and booked the whale watching trip! I felt horrible. I was running around the boat watching these majestic creatures breech and play while she was lumped in a corner of the cabin, drowned in Dramamine, just wanting to get the hell out of there. When we got back to shore we took it easy and walked around the wharf looking at this and that while she regained control of her world. Eventually she started to perk up and we stumbled into a crepe shop. We ordered a pair of Nutella crepes, and I cherish the photo of her devouring the treat and cracking her first smile of the day. Since then I’ve known that a Nutella stout must come to life, and here we are. We are not using actual Nutella, as that would be crazy expensive, likely not yield the correct experience, and the natural fats would oxidize and taste horrible. Instead we are using pure liquid cacao made by Cholaca (same stuff we use in Diet Starts Tomorrow), and natural hazelnut extract. In the end, it will mostly be the aroma coming from the extract. We got fancy on the grain bill and utilized various grains to give most of the roasted nut flavor. So far it is excellent and I can’t wait to try the finished product. Next month will be an imperial lager…..more on that later.